39 Elveden Park SW, Calgary - 3 beds, 3 baths - For Sale Janet Preston/John (J.R.) Rogers - DISCOVER REAL ESTATE LTD. 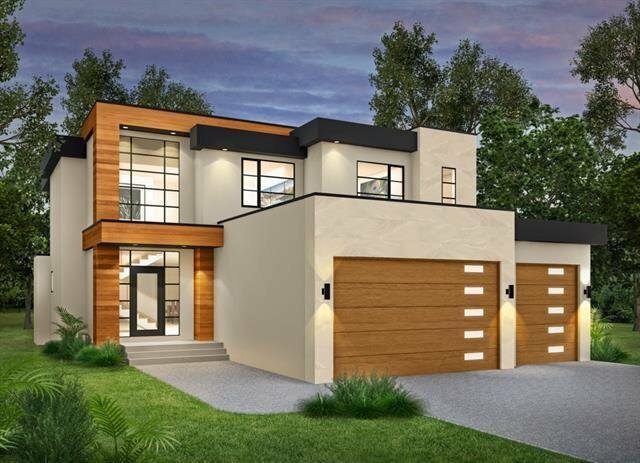 This is your opportunity to build a modern, custom built luxury dream home with master homebuilder Moderno. You'll love living in the new development of Elveden Park, one of the most desirable westside communities of Springbank Hill. This 2691 SF open concept floor plan features soaring 19.5 foot ceilings, great room with 36" linear gas-burning fireplace, partial mountain views and a treed and private backyard oasis. You'll adore the spacious modern kitchen and dining area with sliding french doors lockers and powder room completes the main. The upper level is highlighted by a spacious master with coffered ceilings, large walk-in and luxurious ensuite with oversized shower and soaker tub. Two additional beds, (optional bonus room or 4th bed), 4 pc bath and laundry will complete. Basement will be undeveloped and ready for your design plans. Additional features include exposed aggregate concrete exterior, 9' ICF foundation walls, 4K fiber optics capacity, complete yard fencing, landscaping and more.